Born: 3 July 1848, Magdeburg, Germany. Died: 31 March 1920, Bonn, Germany. A.D. Lothar von Trotha, German soldier, joined the military in November 1865 and the next year fought for Prussia in the Seven Weeks War against Austria. During 1870-1871 he saw active duty again in the war against France, was wounded twice, and received the Iron Cross (second class). He was promoted to lieutenant-colonel in 1893 and the next year was transferred to the Department of Foreign Affairs for service in the German colonies. 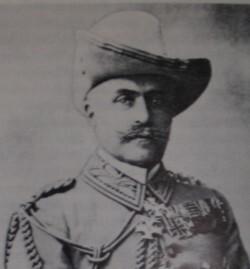 From 1894 to 1897 he served as governor and commander of the Schutztruppe (colonial forces) in German East Africa, where he was successful in supressing the Wahehe revolt of 1896. After helping to suppress the Boxer revolt in China in 1900 he was awarded the Order of the Red Eagle (second class) and promoted to lieutenant-general upon his return to Germany in March 1903. In May 1904 von Trotha was appointed commander of the colonial forces in German South West Africa (now Namibia) with the task of suppressing the Herero revolt there. In August 1904 his forces won a decisive battle against the Hereros at the Waterberg. However, the Hereros would not surrender and fled eastwards into the dry Sandveld, ruthlessly pursued by the German forces, where many died of thirst. Next von Trotha's forces defeated the Namas in the south of the territory, before he returned to Germany in November 1905. In May the next year he retired from acive service. Von Trotha was interested in natural history and during his campaigns collected plants and birds. The specimens that he collected in Hereroland and Namaland were sent to museums in Berlin. The local subspecies of the Chestnut Weaver, Ploceus rubiginosis trothae, was named after him by A. Reichenow* in 1905. He was also commemorated in the plant species Zygophyllum trothai.